One Birthday, 20 Volunteers, 300 Trees: What Trees Teach us About Belonging and Life | FEED, Inc.
29 July 2017, Laguna Quezon Land Grant (LQLG), Siniloan. On the 29th of July 2017, Chivas Vinzons Alejo, an alumnus of Development Communication and Broadcasting at the University of the Philippines Los Baños (UPLB), FEED’s first and longest LIVING LEGACY partner. A friend of one of FEED’s advisors Mar Gatus, Chivas is also one of the initial founders of the UP SIBOL – Service. Integrity. Benevolence. Objectivity. Leadership. 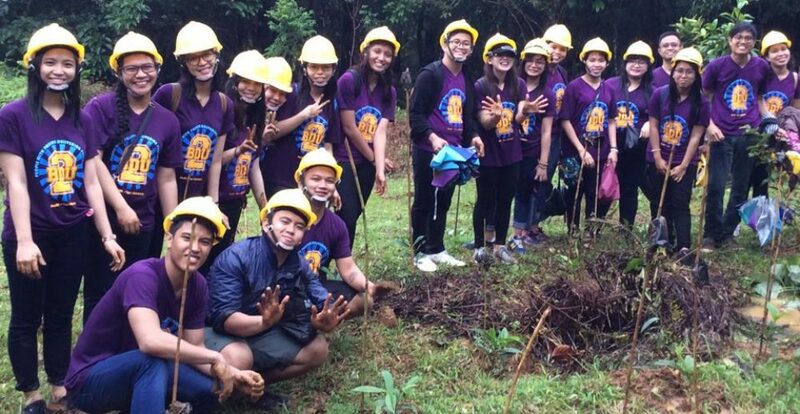 The 20 family and friends Chivas gathered also included other UP SIBOL members, who together planted 300 trees to help restore the lost forest* cover on part of the near 10,000 hectare LQLG of UPLB, at the Sierra Madre mountain range – one of the Philippines last remaining old growth forests. Aside from Chivas celebrating his birthday through tree planting, we also planted 200 in the name of FEED’s ex-Treasurer Cecilia Dinglasan, one of FEED’s incorporators as well as a long time friend of FEED’s President Ophelia Bakker-Mananquil. On this same day, certified UPLB Forester Reynaldo Lorida who manages more than half of the LQLG, said: “It does not matter what we call it or where it originates, whether it is illegal commercialized logging, timber poaching or charcoal making, forest destruction is something we all have to face, most often triggered by poverty and lack of livelihood opportunities for those who risk their lives for wood and tree derivatives”. The destruction of forests in The Philippines has followed a similar pattern as that of other Southern countries. Part of the forest has been cut down by “kaingineros” (slash-and-burn farmers), but by far most of the forest destruction has been carried out legally by logging companies having close links with Government officials. Thank you to Sir Mar Gatus, Chivas and all the amazing eco-warriors who joined us on this day! I woke up this morning to discover a tiny birch tree rising amidst my city quasi-garden, having overcome unthinkable odds to float its seed over heaps of concrete and glass, and begin a life in a meager oasis of soil. And I thought, my god*, what a miracle. What magic. What a reminder that life does not await permission to be lived. Contact info@feed.org.ph or call/text us any time to explore Students & Volunteers for the Environment (SAVE) or your Corporate Social Responsibility (CSR) programs; or to design your own environmental activity with us.